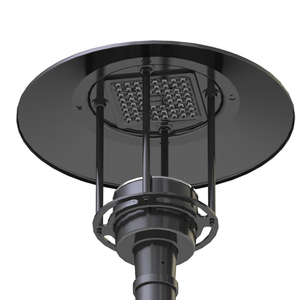 The versatile transitional designed lighting fixture was created to yield the ultimate in flexibility in LED Post Top Lighting, this classic geometric form of a cylinder offers 3 different top shades, 3 LED wattages, and 5 different full cutoff lighting distributions making it an ideal solution for the urban setting and the educational or medical campus. Its integral LifeShield thermal regulator insures maximum life and energy efficiency. Also available is a no glare LED indirect system, for use in low mounting height pedestrian walkway lighting applications.